Not to be confused with Hendrikus Albertus Lorentz or Ludvig Lorenz. See also Lorentz and Lorenz. Hendrik Antoon Lorentz (/ˈlɒrənts/; 18 July 1853 – 4 February 1928) was a Dutch physicist who shared the 1902 Nobel Prize in Physics with Pieter Zeeman for the discovery and theoretical explanation of the Zeeman effect. He also derived the transformation equations underpinning Albert Einstein's theory of special relativity. According to the biography published by the Nobel Foundation, "It may well be said that Lorentz was regarded by all theoretical physicists as the world's leading spirit, who completed what was left unfinished by his predecessors and prepared the ground for the fruitful reception of the new ideas based on the quantum theory." He received many honours and distinctions, including a term as chairman of the International Committee on Intellectual Cooperation, the forerunner of UNESCO, between 1925 and 1928. On 17 November 1877, only 24 years of age, Hendrik Antoon Lorentz was appointed to the newly established chair in theoretical physics at the University of Leiden. The position had initially been offered to Johan van der Waals, but he accepted a position at the Universiteit van Amsterdam. [B 2] On 25 January 1878, Lorentz delivered his inaugural lecture on "De moleculaire theoriën in de natuurkunde" (The molecular theories in physics). In 1881, he became member of the Royal Netherlands Academy of Arts and Sciences. Lorentz theorized that atoms might consist of charged particles and suggested that the oscillations of these charged particles were the source of light. When a colleague and former student of Lorentz's, Pieter Zeeman, discovered the Zeeman effect in 1896, Lorentz supplied its theoretical interpretation. The experimental and theoretical work was honored with the Nobel prize in physics in 1902. Lorentz' name is now associated with the Lorentz-Lorenz formula, the Lorentz force, the Lorentzian distribution, and the Lorentz transformation. In 1892 and 1895, Lorentz worked on describing electromagnetic phenomena (the propagation of light) in reference frames that move relative to the postulated luminiferous aether. He discovered that the transition from one to another reference frame could be simplified by using a new time variable that he called local time and which depended on universal time and the location under consideration. Although Lorentz did not give a detailed interpretation of the physical significance of local time, with it, he could explain the aberration of light and the result of the Fizeau experiment. In 1900 and 1904, Henri Poincaré called local time Lorentz's "most ingenious idea" and illustrated it by showing that clocks in moving frames are synchronized by exchanging light signals that are assumed to travel at the same speed against and with the motion of the frame (see Einstein synchronisation and Relativity of simultaneity). In 1892, with the attempt to explain the Michelson-Morley experiment, Lorentz also proposed that moving bodies contract in the direction of motion (see length contraction; George FitzGerald had already arrived at this conclusion in 1889). In 1899 and again in 1904, Lorentz added time dilation to his transformations and published what Poincaré in 1905 named Lorentz transformations. It was apparently unknown to Lorentz that Joseph Larmor had used identical transformations to describe orbiting electrons in 1897. Larmor's and Lorentz's equations look somewhat dissimilar, but they are algebraically equivalent to those presented by Poincaré and Einstein in 1905. [B 3] Lorentz's 1904 paper includes the covariant formulation of electrodynamics, in which electrodynamic phenomena in different reference frames are described by identical equations with well defined transformation properties. The paper clearly recognizes the significance of this formulation, namely that the outcomes of electrodynamic experiments do not depend on the relative motion of the reference frame. The 1904 paper includes a detailed discussion of the increase of the inertial mass of rapidly moving objects in a useless attempt to make momentum look exactly like Newtonian momentum; it was also an attempt to explain the length contraction as the accumulation of "stuff" onto mass making it slow and contract. Albert Einstein and Hendrik Antoon Lorentz, photographed by Ehrenfest in front of his home in Leiden in 1921. 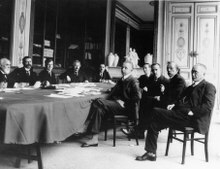 Lorentz (left) at the International Committee on Intellectual Cooperation of the League of Nations, here with Albert Einstein. In 1906, Lorentz's electron theory received a full-fledged treatment in his lectures at Columbia University, published under the title The Theory of Electrons. The increase of mass was the first prediction of Lorentz and Einstein to be tested, but some experiments by Kaufmann appeared to show a slightly different mass increase; this led Lorentz to the famous remark that he was "au bout de mon latin" ("at the end of my [knowledge of] Latin" = at his wit's end) The confirmation of his prediction had to wait until 1908 and later (see Kaufmann–Bucherer–Neumann experiments). It will be clear by what has been said that the impressions received by the two observers A0 and A would be alike in all respects. It would be impossible to decide which of them moves or stands still with respect to the ether, and there would be no reason for preferring the times and lengths measured by the one to those determined by the other, nor for saying that either of them is in possession of the "true" times or the "true" lengths. This is a point which Einstein has laid particular stress on, in a theory in which he starts from what he calls the principle of relativity, [...] I cannot speak here of the many highly interesting applications which Einstein has made of this principle. His results concerning electromagnetic and optical phenomena ... agree in the main with those which we have obtained in the preceding pages, the chief difference being that Einstein simply postulates what we have deduced, with some difficulty and not altogether satisfactorily, from the fundamental equations of the electromagnetic field. By doing so, he may certainly take credit for making us see in the negative result of experiments like those of Michelson, Rayleigh and Brace, not a fortuitous compensation of opposing effects, but the manifestation of a general and fundamental principle. [...] It would be unjust not to add that, besides the fascinating boldness of its starting point, Einstein's theory has another marked advantage over mine. Whereas I have not been able to obtain for the equations referred to moving axes exactly the same form as for those which apply to a stationary system, Einstein has accomplished this by means of a system of new variables slightly different from those which I have introduced. 1909: Yet, I think, something may also be claimed in favour of the form in which I have presented the theory. I cannot but regard the ether, which can be the seat of an electromagnetic field with its energy and its vibrations, as endowed with a certain degree of substantiality, however different it may be from all ordinary matter. 1910: Provided that there is an aether, then under all systems x, y, z, t, one is preferred by the fact, that the coordinate axes as well as the clocks are resting in the aether. If one connects with this the idea (which I would abandon only reluctantly) that space and time are completely different things, and that there is a "true time" (simultaneity thus would be independent of the location, in agreement with the circumstance that we can have the idea of infinitely great velocities), then it can be easily seen that this true time should be indicated by clocks at rest in the aether. However, if the relativity principle had general validity in nature, one wouldn't be in the position to determine, whether the reference system just used is the preferred one. Then one comes to the same results, as if one (following Einstein and Minkowski) deny the existence of the aether and of true time, and to see all reference systems as equally valid. Which of these two ways of thinking one is following, can surely be left to the individual. Lorentz also gave credit to Poincaré's contributions to relativity. Indeed, for some of the physical quantities which enter the formulas, I did not indicate the transformation which suits best. That was done by Poincaré and then by Mr. Einstein and Minkowski [...] I did not succeed in obtaining the exact invariance of the equations [...] Poincaré, on the contrary, obtained a perfect invariance of the equations of electrodynamics, and he formulated the "postulate of relativity", terms which he was the first to employ. [...] Let us add that by correcting the imperfections of my work he never reproached me for them. The total eclipse of the sun of May 29, resulted in a striking confirmation of the new theory of the universal attractive power of gravitation developed by Albert Einstein, and thus reinforced the conviction that the defining of this theory is one of the most important steps ever taken in the domain of natural science. Lorentz gave a series of lectures in the Fall of 1926 at Cornell University on the new quantum mechanics; in these he presented Erwin Schrödinger's wave mechanics. The most satisfactory theory is that of Lorentz; it is unquestionably the theory that best explains the known facts, the one that throws into relief the greatest number of known relations ... it is due to Lorentz that the results of Fizeau on the optics of moving bodies, the laws of normal and abnormal dispersion and of absorption are connected with each other ... Look at the ease with which the new Zeeman phenomenon found its place, and even aided the classification of Faraday's magnetic rotation, which had defied all Maxwell's efforts. ... at every moment [the twenty physicists from different countries] could be heard talking of the [quantum mechanics] which they contrasted with the old mechanics. Now what was the old mechanics? Was it that of Newton, the one which still reigned uncontested at the close of the nineteenth century? No, it was the mechanics of Lorentz, the one dealing with the principle of relativity; the one which, hardly five years ago, seemed to be the height of boldness. Lorentz was also asked by the Dutch government to chair a committee to calculate some of the effects of the proposed Afsluitdijk (Enclosure Dam) flood control dam on water levels in the Waddenzee. Hydraulic engineering was mainly an empirical science at that time, but the disturbance of the tidal flow caused by the Afsluitdijk was so unprecedented that the empirical rules could not be trusted. Originally Lorentz was only supposed to have a coordinating role in the committee, but it quickly became apparent that Lorentz was the only physicist to have any fundamental traction on the problem. In the period 1918 till 1926, Lorentz invested a large portion of his time in the problem. Lorentz proposed to start from the basic hydrodynamic equations of motion and solve the problem numerically. This was feasible for a "human computer", because of the quasi-one-dimensional nature of the water flow in the Waddenzee. The Afsluitdijk was completed in 1932, and the predictions of Lorentz and his committee turned out to be remarkably accurate. [B 11][B 2] One of the two sets of locks in the Afsluitdijk was named after him. In 1881, Lorentz married Aletta Catharina Kaiser. Her father was J.W. Kaiser, a professor at the Academy of Fine Arts. He was the Director of the museum which later became the well-known Rijksmuseum (National Gallery). He also was the designer of the first postage stamps of The Netherlands. There were two daughters, and one son from this marriage. Dr. Geertruida Luberta Lorentz, the eldest daughter, was a physicist. She married Professor W.J. de Haas, who was the Director of the Cryogenic Laboratory at the University of Leiden. The funeral took place at Haarlem at noon on Friday, February 10. At the stroke of twelve the State telegraph and telephone services of Holland were suspended for three minutes as a revered tribute to the greatest man the Netherlands has produced in our time. It was attended by many colleagues and distinguished physicists from foreign countries. The President, Sir Ernest Rutherford, represented the Royal Society and made an appreciative oration by the graveside. Unique 1928 film footage of the funeral procession with a lead carriage followed by ten mourners, followed by a carriage with the coffin, followed in turn by at least four more carriages, passing by a crowd at the Grote Markt, Haarlem from the Zijlstraat to the Smedestraat, and then back again through the Grote Houtstraat towards the Barteljorisstraat, on the way to the "Algemene Begraafplaats" at the Kleverlaan (northern Haarlem cemetery) has been digitized on YouTube. [B 13] Einstein gave a eulogy at a memorial service at Leiden University. In addition to the Nobel prize, Lorentz received a great many honours for his outstanding work. He was elected a Foreign Member of the Royal Society (ForMemRS) in 1905. The Society awarded him their Rumford Medal in 1908 and their Copley Medal in 1918. ^ Hendrik Lorentz (1875). "Over de theorie der terugkaatsing en breking van het licht" (PDF). 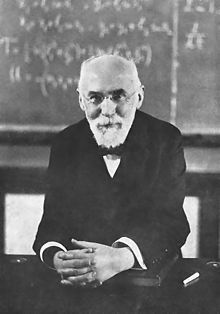 ^ "Hendrik Antoon Lorentz (1853 - 1928)". Royal Netherlands Academy of Arts and Sciences. Retrieved 17 July 2015. ^ Poincaré, Henri (1900), "La théorie de Lorentz et le principe de réaction" , Archives Néerlandaises des Sciences Exactes et Naturelles, 5: 252–278 . See also the English translation. ^ Einstein, Albert (1905), "Zur Elektrodynamik bewegter Körper" (PDF), Annalen der Physik, 322 (10): 891–921, Bibcode:1905AnP...322..891E, doi:10.1002/andp.19053221004 . See also: English translation. ^ a b Lorentz, Hendrik Antoon (1910) . "Das Relativitätsprinzip und seine Anwendung auf einige besondere physikalische Erscheinungen" . In Blumenthal, Otto; Sommerfeld, Arnold (eds.). Das Relativitätsprinzip. Eine Sammlung von Abhandlungen. pp. 74–89. ^ Lorentz, Hendrik Antoon (1914). Das Relativitätsprinzip. Drei Vorlesungen gehalten in Teylers Stiftung zu Haarlem (1913) . Leipzig and Berlin: B.G. Teubner. ^ Lorentz, H. A. (1926). The New Quantum Theory (PDF). Ithaca, New York: Typescript of Lecture Notes. Retrieved August 12, 2016. ^ Poincaré, Henri (1902), Science and Hypothesis, London and Newcastle-on-Cyne (1905): The Walter Scott publishing Co. Many papers by Lorentz (mostly in English) are available for online viewing in the Proceedings of the Royal Netherlands Academy of Arts and Science, Amsterdam. ^ Russell McCormmach. "Lorentz, Hendrik Antoon". Complete Dictionary of Scientific Biography. Retrieved 25 April 2012. Although he grew up in Protestant circles, he was a freethinker in religious matters; he regularly attended the local French church to improve his French. ^ a b c d e f g h i j Kox, Anne J. (2011). "Hendrik Antoon Lorentz (in Dutch)". Nederlands Tijdschirft Voor Natuurkunde. 77 (12): 441. ^ Miller, Arthur I. (1981). Albert Einstein's special theory of relativity. Emergence (1905) and early interpretation (1905–1911). Reading: Addison–Wesley. ISBN 978-0-201-04679-3. ^ Kox, A.J. (1993). "Einstein, Lorentz, Leiden and general relativity". Class. Quantum Grav. 10: S187–S191. Bibcode:1993CQGra..10S.187K. doi:10.1088/0264-9381/10/S/020. ^ Janssen, M. (1992). "H. A. Lorentz's Attempt to Give a Coordinate-free Formulation of the General. Theory of Relativity.". Studies in the History of General Relativity. Boston: Birkhäuser. pp. 344–363. ISBN 978-0817634797. ^ Justin Wintle (8 February 2002). Makers of Nineteenth Century Culture: 1800–1914. Routledge. pp. 375–. ISBN 978-0-415-26584-3. Retrieved 25 July 2012. ^ Langevin, P. (1911), "The evolution of space and time", Scientia, X: 31–54 (translated by J. B. Sykes, 1973). ^ (Arch. ex. hist. Sci, 1984). ^ "Carlo Beenakker". Ilorentz.org. Retrieved 2012-02-01. ^ a b Richardson, O. W. (1929), "Hendrik Antoon Lorentz", J. London Math. Soc., 4 (1): 183–192, doi:10.1112/jlms/s1-4.3.183 . The biography which refers to this article (but gives no pagination details other than those of the article itself) is O'Connor, John J.; Robertson, Edmund F., "Hendrik Lorentz", MacTutor History of Mathematics archive, University of St Andrews . Langevin, Paul (1911), "L'évolution de l'espace et du temps", Scientia, X: 31–54 :n.p. Poincaré, Henri (1900), "La théorie de Lorentz et le principe de réaction", Archives Néerlandaises des Sciences Exactes et Naturelles, V: 253–278 See English translation. Wikimedia Commons has media related to Hendrik Antoon Lorentz. Scanned Ph.D. theses of the students of Lorentz. This page was last edited on 14 April 2019, at 14:04 (UTC).